Staples 25 sheets at a time using S.F. 4 Premium Swingline Staples. This black and pink SmartTouch Pink Ribbon Stapler from Swingline powers through 25 sheets at a time with up to 50% less effort than standard staplers. Sleek and stylish, this full strip desktop stapler brings ease and simplicity to everyday stapling tasks. With soft-touch accents and an ergonomic design, this black and pink stapler is perfect for office use. QuickLoad technology makes front loading staples easy. Swingline recommends using S.F. 4 Premium Staples for optimal performance. A portion of each order is donated toward the National Breast Cancer Foundation. Product number SWI-66518. Staples up to 25 sheets with S.F.® 4® Premium staples. Full strip size holds 210 staples. Welcome to MyBinding video. 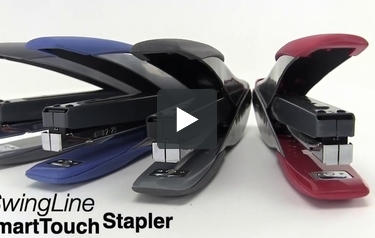 Let's have a look at this Desktop Electric Cartridge Stapler by Swingline. As part of Swingline's Professional series, this stapler can punch up to 25 sheets of 20lb paper per punch. It's small, lightweight, and easy to use. The advantage of a cartridge stapler is the ease of loading and unloading staples. This stapler comes with one cartridge with 5,000 staples in it, so you don't have to change it all that often. But when you do, lift the latch in the back and pull it out, and slide a new one right back in, then put the latch right back down. The lid snaps on, slides backwards, and you're set to go. It's extremely quiet, takes up no space, and the suction feet on the bottom keep it from moving around. That's Swingline's Desktop Cartridge Electric Stapler. For more demos, reviews, and how-tos, check out MyBinding.com.